Water treatment is a common and important aspect of any chemical plant operation. It is often used in cooling towers and steam boilers. In the case of cooling towers, the water must be as clean as possible. Otherwise, heat transfer equipment becomes scaled, fouled, and lined with microbial growth. In boilers, scaling is a significant problem. Calcium is one of the few elements that grows more soluble at lower temperatures, and high-temperature operation leads to its precipitation. Furthermore, steel piping is more likely to corrode at higher temperatures. Electrolytes corrode piping more easily during boiling; therefore, boiler feed water must be nearly 100% pure. Despite the importance of proper water treatment, operators sometimes take shortcuts or commit oversights. Mistakes in the design, specification, or operation of a water treatment system usually lead to poor results or failed equipment. One common mistake is to install a water softener instead of a demineralizer. The purpose of a water softener is to remove calcium. 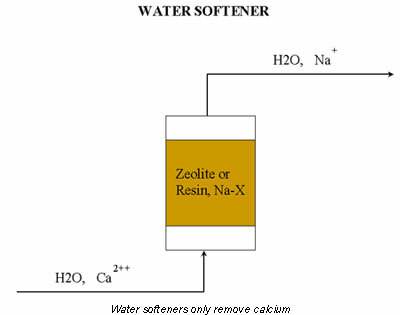 A water softener contains a zeolite or a resin that is bonded to sodium (see Figure 1, where X is an inorganic for zeolites and an organic for resins). When the water flows through the softener, an ionic exchange replaces calcium with sodium. Although it contains no calcium, the water may still such fouling agents as dissolved solids, anions, and oxygen. For this reason, the best solution is a demineralizer (see Figure 2). 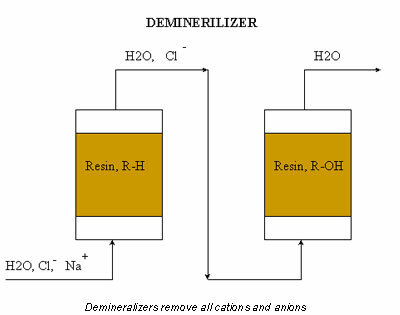 A demineralizer usually contains two packed beds filled with resin, one resin is bonded to a hydronium ion (R-H) and the other to a hydroxide ion (R-OH). As water travels through the first ion-exchange column, it replaces cations with hydronium ions. The second ion-exchange column replaces anions with hydroxide ions. The hydronium ions and hydroxide ions then react to form water. The net effect is ultrapure water. "Often, the problem is improper industry standards," says Laura Gimpelson of LG Environmental Engineering (Houston, TX). "For example, industry standards suggest softened water or demineralized water for use in 600-900 psig steam systems. Many companies select softened water because these systems are cheap and have a smaller footprint. "Six months later, however, the condensate contains high dissolved solids and oxygen — constituents that remain after water softening — and these constituents limit reuse. Using a demineralizer removes most of these dissolved solids and allows for more of the recovered condensate to be reused with minimal treatment." 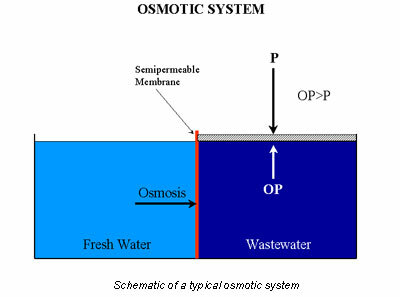 A popular method of treating wastewater is reverse osmosis, which is based on the principle of chemical equilibrium (Figure 3). When a semipermeable membrane separates fresh water and wastewater, the fresh water tends to diffuse into the wastewater. This happens because of the concentration gradient that exists across the membrane for the pollutant. The system attempts to establish equilibrium and a uniform concentration across the membrane. Applying pressure, P, to the system halts diffusion across the membrane. The pressure needed to stop mass transfer is said to be equal to the osmotic pressure, OP. If the applied pressure is greater than the osmotic pressure, pure water will reverse its flow (see Figure 4). 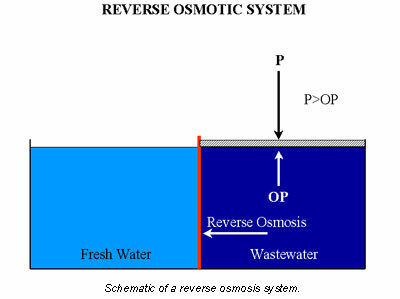 This is basis of the reverse osmosis (RO) principle used by many companies to purify their wastewater systems. A common operating mistake in RO systems is to neglect the precipitation of dissolved solids. It is easy to forget that RO systems are waste concentrators. Thus, during operation, the attention is normally focused on suspended solids. What is forgotten is that as wastes build up, precipitation occurs. The unavoidable result is fouling, high pressure drops, and inefficiency. Lee Comb of Osmonics Inc. (Minnetonka, MN) addressed the issue in his paper, Wastewater Recovery Using Reverse Osmosis. "The chemistry plays such an important role because the system is constantly concentrating contaminants," Comb notes. "In fact, one shouldn't think of a membrane system for wastewater processing as a ‘filtration system', but, rather as a ‘waste concentrator', constantly increasing the contaminant concentrations, producing purified water as a byproduct. "This is important since it is the ‘concentration' aspect that is so often taken lightly," Comb continues. "And it can be the key to the successful design of a wastewater membrane application. This concentration ‘factor' — that is the degree of concentration — relates to both soluble solids and insoluble solids alike. Clearly, if one concentrates insoluble solids to a point where they tend to accumulate within a system, problems will develop. "Concentration of dirt is fairly straight forward. What often does not appear to be all that clear are potential problems harbored within the make-up of the soluble solids. As they become concentrated, certain species can surpass their limit of solubility, creating a problematic insoluble solid". ISO 9000 is one of the most important quality programs in the world. It focuses on developing well-defined procedures for the production of consistent products. These procedures assume a well defined training program. After all, employees well trained in their jobs will run a more successful production process. In The QS-9000 Book, authors John Rabbitt and Peter Bergh explain that customers may ask, "Prove to me that the people who built and tested my product are trained. Do they know all the critical aspects of my product and how it should work? Has the supervisor agreed that the person is trained properly?" As Rabbitt and Bergh point out, it is the job of the supervisor to verify that employees have the proper training. But, what if the supervisor has not been trained? Who is training the trainer? In wastewater treatment, many times supervisors are not given the proper training, says LG Environmental's Gimpleson. Yet they are supposed to supervise and train others. "When a new supervisor is assigned or the water treatment system is added to a current supervisor's work load, they receive little or no training," she says. "Often the supervisor is given the operating manual, maybe a textbook or two, and told ‘It is so simple, you can pickup what you need to know in a few hours of reading.'" "Unless the new supervisor is familiar with water chemistry and water quality standards, these resources are like reading your tax forms, boring and confusing," she says. "After several attempts to read the material, the new supervisor will give up and rely on the operators' experience to keep the system running. The best solution is to provide basic system operations training to the new or part-time supervisor within the first month or two of assuming the new duties." For more information: Laura Gimpelson, LG Environmental Engineering, 4638 Cairnsean, Houston, TX 77084. Phone: 281-856-8833. E-mail: lgenveng@aol.com. And: Osmonics, 5951 Clearwater Dr., Minnetonka, MN 55343. Phone: 612-933-2277. Fax: 612-933-0141. E-mail: osmonics@worldnet.att.net.